Rick Perry sharpened his populist tirade against Wall Street financiers and Washington politicians Wednesday, saying Americans had been “snookered” by bogus investments and a string of taxpayer-financed bailouts. CONCORD, N.H. — Rick Perry sharpened his populist tirade against Wall Street financiers and Washington politicians Wednesday, saying Americans had been “snookered” by bogus investments and a string of taxpayer-financed bailouts. Wrapping up a two-day swing through first-test New Hampshire with an energetic address before the state House of Representatives, Perry vowed to cut congressional pay in half and send corrupt business executives to jail if he’s elected president. As he spoke, a boisterous group of pro-union demonstrators were protesting the legislation outside the domed New Hampshire state House. About an hour after Perry left, the protesters were cheering the vote that followed: The House turned back an attempt to override Democratic Gov. John Lynch’s May veto of the bill, meaning that current collective bargaining laws will stay in place. Perry went slightly over the 10 minutes he was given to speak, delivering an animated and well-received address. Rival presidential candidate Jon Huntsman spoke right after Perry. In recent weeks Perry has ratcheted up the rhetoric against political and business elites, promising to take a “sledgehammer” and a “wrecking ball” to Washington and remaking Congress in the image of the part-time Texas Legislature — no stranger itself to ethical lapses and charges of corruption. On Wednesday, Perry rolled out a new line: He said America’s woes woes could be “diagrammed on a napkin” with a line connecting two dots: Washington, D.C., and Wall Street. The governor, who has said Federal Reserve Chairman Ben Bernanke and Treasury Secretary Timothy Geithner should resign, has also been trying to gin up outrage against secret loan guarantees made to big banks between 2007 and 2009 — 7.7 trillion in all, according to Bloomberg Markets magazine. Perry’s speeches Wednesday underscored the increasingly fiery, populist message beneath his standard stump speech. A day earlier, Perry had taken a detour back into the debate over illegal immigration. In several appearances, Perry touted the endorsement of hardliner Arizona Sheriff Joe Arpaio and vowed to deport every illegal alien apprehended inside the United States. 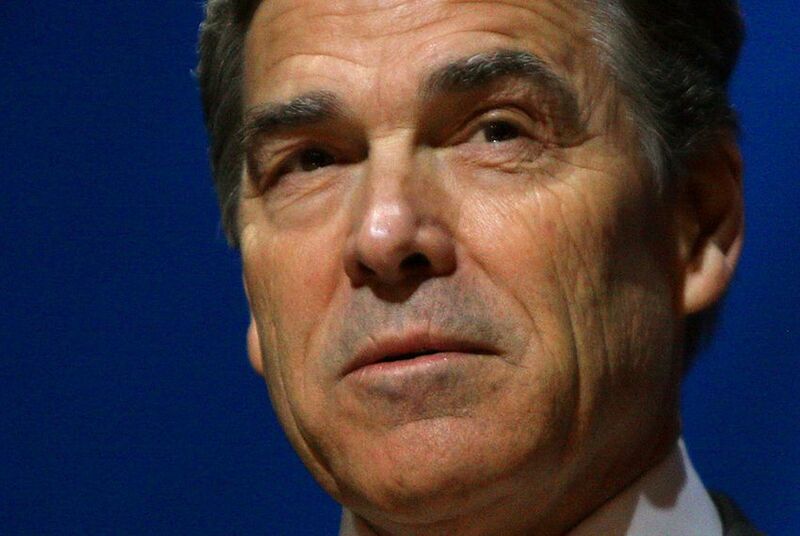 Perry has been far less clear on what to do with all the illegal immigrants in the country today. In stump speeches and media interviews Perry has repeatedly dodged questions about specific long-term solutions to illegal immigration.